With Cinfy's BOT Model, you get the benefit of a trusted local partner to setup your subsidiary efficiently for a time period. After the completion of the decided span, we transfer the assets and handover the operations along with manpower to you. In other words, we create a dedicated offshore development center for your growing business requirements. Added to this, you also get support of innovative and cost-effective solutions for your expansion plans. We ensure a swift startup of your operations in the most cost-effective and proficient method. Your subsidiary has access to amenities and resources that reduces your attrition and increases your security. Our center will become an extension of your business operations wherein you get all the benefits of outsourcing with the option of retaining total control. We will execute your operations using the best technology available and when you are ready, we gradually transfer the ownership of the complete operations to you. You control the projects and the allocation of skills - our skilled and competent technologists become your employees, a permanent extension of your staff, fully integrated into your corporate culture. We take care of all your operations for a decided time period. We run your operations with complete responsibility as per the decided objectives to ensure effective results. However, the financial and the operational ownership of the project stays entirely with the client. We ensure a smooth flow of the various processes. Companies that opt for the build-operate-transfer model have a vision to own and operate its own organization, usually in a foreign country, but would like to strengthen its capabilities first and mitigate a newbie's risks during the start-up stage. Hence, the company undertakes a contract with an outsourcing company to build an offshore delivery or shared services organization and operates it for a set period. Save money and make the company more profitable - Business is all about saving a dollar rather than selling a dollar and that's why BOT places a huge emphasis on cutting cost in any way possible. 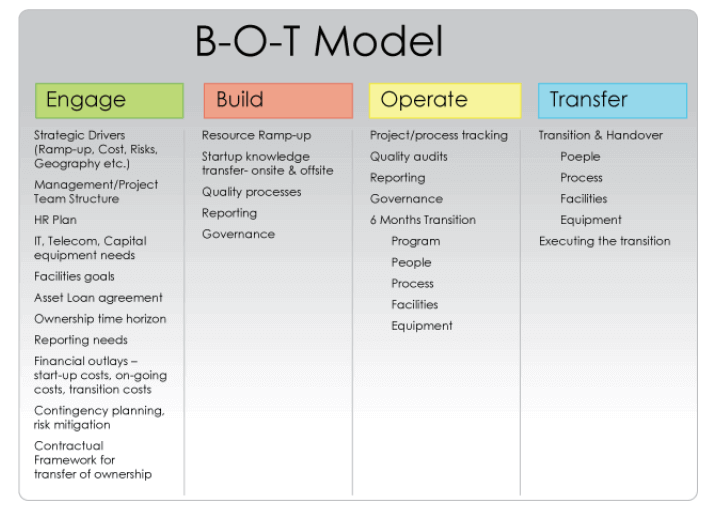 Typically, BOT project saves as much as 60% of the normal cost as the project itself is owned, operated and managed by an off-shore team. And the money, which BOT save can be used to enrich the company employees. Plus, it could be invested in capital or can be used to employ more people. Help product come to the market faster - With a team of resources in different time zone, BOT helps the company to bring the product and enhancement to market faster. Plus, it also manages the business need on 24/7 cycle. Minimize the risks - Every country runs into a problem at some point. Don't worry! BOT is here. BOT lower the risk of a country by providing diversifying investment for the investors. Plus, it also offers diversifying workforce and workplace, which provide flexibility to hedge against a problem in any one country.